Restored to its former glory - and then some. The Royal Suite is fit for exactly that. Traditional look with a modern finish. The 'Amazing Space' Spa deserves the name. 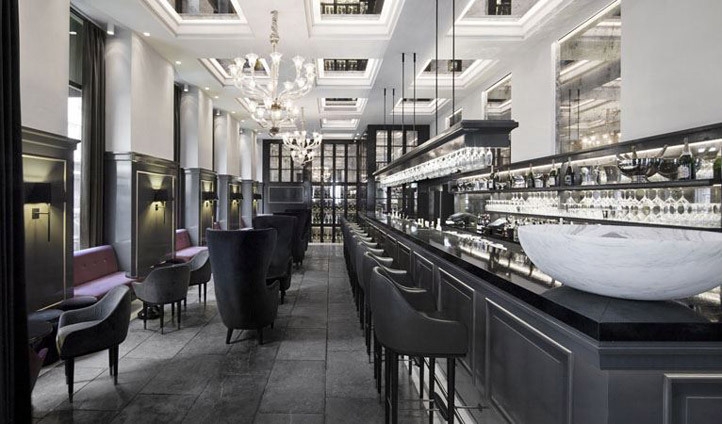 The elegant Balthazar champagne bar - one of the finest in town. Dating back to the 1870s, this magnificent palatial landmark has recently undergone the most ambitious hotel renovation process in Denmark’s history – with spectacular results. Firmly restored to its former glory, Hotel d’Angleterre has cemented its reputation as one of the most elegant and luxurious hotels in Northern Europe, let alone Copenhagen. In the heart of the city, a stone’s throw from the increasingly popular waterfront district and “heritage harbor” of Nyhavn, decorated with well-preserved 18th century townhouses, beautiful wooden ships and trendy restaurants. 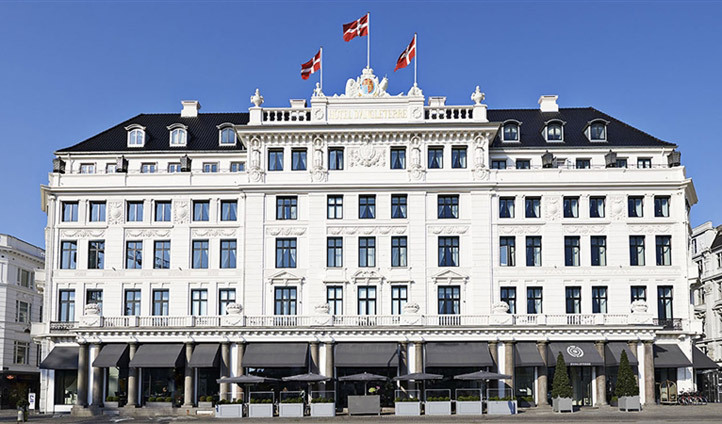 The hotel rubs shoulders with the Royal Danish Theatre, and is connected to the famous Strøget pedestrian storeping street – in short, surrounded by and within easy reach of the best cultural, dining and entertainment experiences that the city has to offer. Each of the 90 rooms and suites was carefully redesigned as part of the refurbishment, carefully appointed with state-of-the-art in-room technologies and modern fittings without compromising any of their original elegance – the result is a tasteful and luxurious blend of contemporary and traditional styles. Every room boasts a grand marble bathroom and individually picked artworks. The rooms are bright and spacious, and many of the suites have balconies – if you’re lucky, yours will have a view of the beautiful Kongens Nytorv square. The Hotel d’Angleterre is practically as iconic a city landmark as any in Copenhagen, equally popular with locals as tourists. The Michelin-starred Marchal restaurant is one of the finest dining experiences in the city, and the Balthazar champagne bar is one of Copenhagen’s most fashionable watering holes. The ‘Amazing Space’ spa is a true city oasis; home to the city’s only indoor swimming pool and offering the most decadent pampering options. Such best-in-class facilities – by any standard, not just as a hotel – generate a sense of authenticity that sets the d’Angleterre apart. At a cost in excess of $70m, the refurbishment was worth every penny in ensuring the legacy of this majestic building is preserved for many years to come.